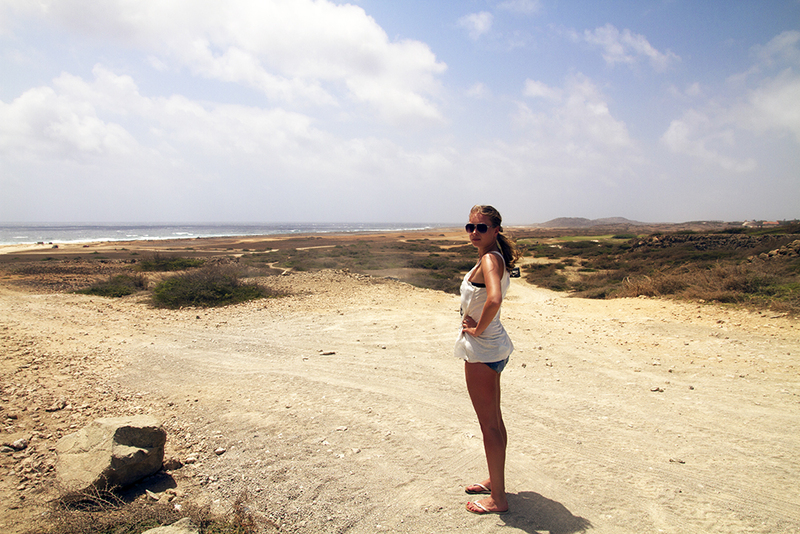 Aruba is a very small, elegant island. I will not go into details of describing the island as google can do it better than me. Our resolution that this be a relaxing vacation, without adventures had lasted two days. On third day, we decided it would be worth a shot to see the lighthouse at the end of the island. The best way to see it would be on foot. So without further ado, we got our camera gear and a bottle of water and started off along the beach. If you look closely at the above photo, our hotel is the building at my left shoulder. We took this photo at the halfway mark to the lighthouse. We started along the beach, passing all the high rise hotels that dot Palm beach. As the condition of the beach changed to more coarse sand and rocky patches, the hotels ended. We walked by the shore, looking for things to photograph. The landscape is eerily devoid of trees and vegetation. You might come across a random divi divi tree or a shrub but grass is almost non existent. The shore was littered with broken conch shells that were organized into mounds. The mounds resembled a funeral pyres of sorts, although I hope that I am wrong. Upon reading that Aruba has been invaded by the Boa constrictors that kill more than 10000 birds per year, I searched in vain every shrub and tree for these camouflaged, silent hunters. The first interesting creature that we came across, turned out to be a dead squid rather than a boa.The squid was stuck between two boulders in a foot of water. I have never seen a squid before, dead or alive and it was impossible not to pick it up to feel the texture and weight of this strange creature. I found the squid to be quite dense and heavy. Elena kept telling me to throw it back into sea, so my examination of the dead squid was cut short. My spirits were lifted that there is life after all on this perfectly manicured island after all. We continued towards the lighthouse which suspiciously did not appear to get any bigger as we passed second hour of the hike. The temperature was steadily rising and without any sign of shade, the trek was getting more interesting by the minute. There was a ship wreck in the distance and we went to explore. The hull was rusted and really did not stand out in any way. Apparently, there was a hurricane that pushed it close to shore. There were a dozen pelicans that we photographed and they proved to be more interesting than the wreck. I tried to get closer to the pelicans but there were small yellow moray eels in the water and without any knowledge about these guys, I decided to let them be and stay on the shore. The second part of the hike was on a road that slightly curved from the beach. 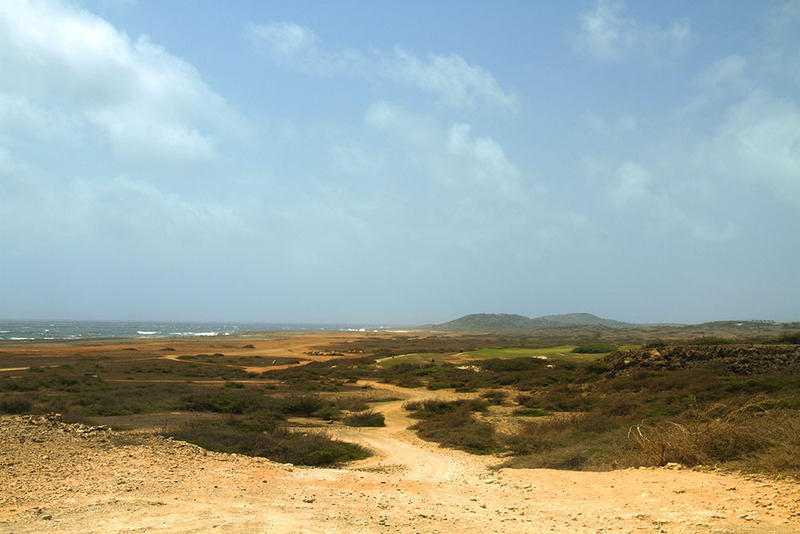 This road hugged a golf course and I was on the look out for a small Aruban burrowing owl. The Shoko. Local newspapers mention that there are only 200 pairs left in the wild and spotting one was a challenge. We decided to make a shortcut and avoid the road that led to the lighthouse. There was a hole in the fence along the golf course and we climbed through that. The landscape changed 30 feet into the bush. For one, there were trees. No snakes though. Then there were various Cacti plants. We photographed whatever came our way and plodded towards the lighthouse. To our dismay, the path to the top was also fenced off. So another detour was needed to get to the top. At last, I found a snake! It was a boa constrictor. It was also very much dead, run over by something that drove in this desolate place. Oh well, this counts in my books! The final part of the hike was uneventful. At last we reached the lighthouse. The area around it was fenced off and off limits to the public. Apparently, someone climbed up the lighthouse and then proceeded to commit suicide. So no view from the top for us. Fortunately, there was a very quaint restaurant overlooking the valley below and we went for a visit. This open concept restaurant was packed with drunk Americans wearing bandannas that were handed out to them on their Catamaran cruise. They were herded back into the Jeeps and were gone in minutes upon our arrival. The sudden quiet that descended was enthralling. It was just the bartender, a lonely mockingbird and us. The beer was cold and crisp and at 2 dollars a bottle, the ambiance couldn’t have been better. We stayed for a few hours, listening to the mockingbird and drinking Balashi beer. The mockingbird would swoop down from the roof and look into the ashtray and fly away. This went on a few times. Then, the bartender opened a can of maraschino-cherries and gently laid down one cherry into the ashtray. The mockingbird immediately swooped down, grabbed the cherry, and flew onto a branch to enjoy the day treat. 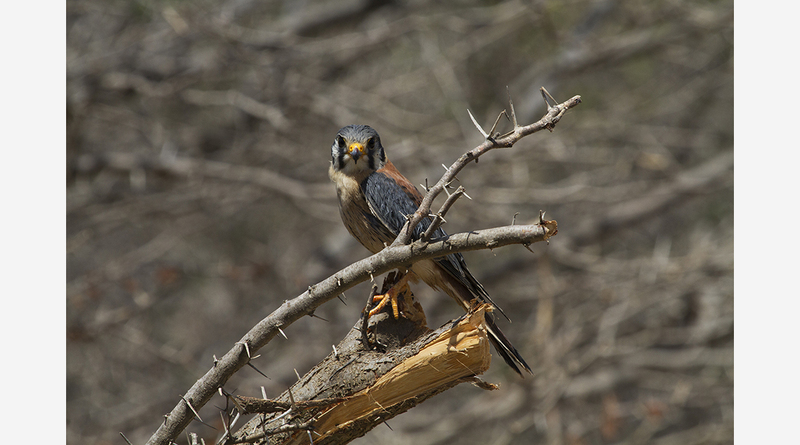 Another delightful moment came when a Kestrel flew in and allowed me to take a few dozen close up pictures of him. The grueling hike up the lighthouse was worth every second. We sat in silence looking past the Greek columns that were entwined in vines. The waves were crashing against the rocks and further out the sea was a myriad of colors. Suddenly the breeze would rise from the sea below and gently caress your face and that would be enough to thank God for life. These are the moments that one should live for.